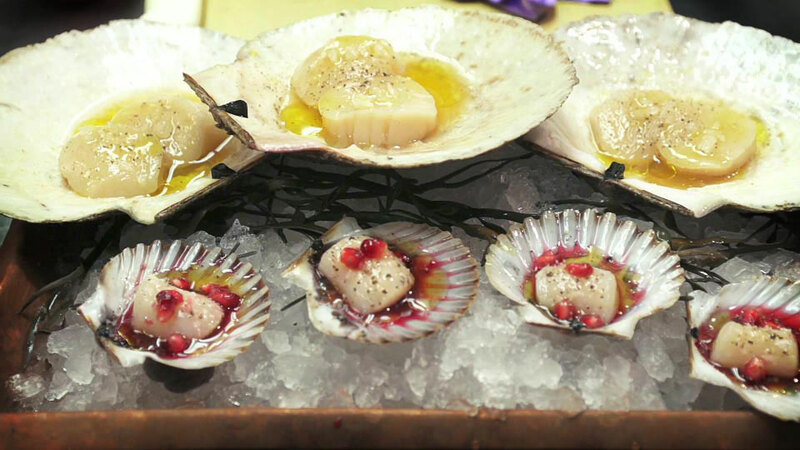 Two simple yet delicious methods for preparing scallops. Prepare the pomegranate juice by cutting it in half and squeezing out the seeds and juice into a bowl. In a mixing bowl, combine the scallops, tangerine juice and olive oil. Spoon onto four serving plates and dress each with pomegranate juice, a light sprinkling of sea salt, black pepper and a few pink peppercorns. Heat the ¼ cup of olive oil in a large saute pan until hot, but not smoking. Add the sugar snap peas and saute until tender and bright (about 4 minutes). Transfer to a bowl and dress with the herb garden vinaigrette (see below). Dry the scallops with paper towels and season both sides with salt and pepper. Heat the remaining 3 tablespoons olive oil in a large, preferably nonstick, saute pan over a medium high flame until smoking. Place the scallops in the pan, top each with a piece of butter, and cook undisturbed for about 3 minutes before turning them. Transfer the cooked scallops to a plate. Divide the dressed sugar snap peas among four serving plates. Top each with 3 scallops. Sprinkle a little sea salt and freshly ground pepper over each and serve immediately. Whisk the oil into the vinegar slowly.